Back on Manhattan’s Upper West Side, the week in southern Texas already seems a bit like a fading dream. I don’t wake up stiff and sore. I don’t worry about which court Coach Stolle will put me on. And I don’t wonder whether I’ll run into Rod Laver in the morning, or the afternoon, and have a casual chat about a match or an opponent I’ve only read about in books, or watched on blurry replays (what did we do before HD?). Murphy (left) and Luke Jensen, protecting Doc Eden from the slings and arrows of outrageous fortune. And from Angus Deane. It was another great week, structurally similar to the two I’d gone to previously, but somehow mellower and richer. Laver—and the combination of Luke and Murph Jensen—get much of the credit. I’ve written at length about the Rocket and not so much about the brothers. But Luke, in my opinion, had a wondrous effect on his brother—acting as a foil, a straight man, and moderating Murph’s natural intensity. On my departure day on Friday, I’d had a brief conversation with organizer Steve Contardi, and he seemed to think that the Jensens—perhaps more than any other Legends in New Braunfels the past week—embodied the Legends Week path forward, the version 2.0 that many of us have wondered about for several years. As Joel Drucker had mentioned to me mid-week, Emmo is 78, Laver 76. Time is moving on. 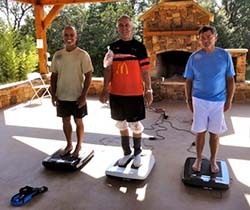 During each day, you could find several campers standing on small scale-like machines in the trainer’s area. Developed by a company called Juvent, these were described to us by company representatives as “micro-impact platforms,” which use what the company calls “Dynamic Motion Therapy” to “stimulate the bone and muscles of an upright person.” You stand on this gadget for 10 to 20 minutes at a time, and the magnetic-driven vibrations generate stem-cell growth that allows for quicker recovery from training and better overall heath. Or so they say. Having Ray Lewis and a professional trainer as your lead testimonials was not particularly convincing to me. But a cell phone video made by Mike Bryan (of the Bryan brothers) seemed compellingly honest. And several campers were swearing by it, including my buddy Rich. I tried it for 20 minutes myself one day, and I have to admit that the next morning was the first—and only time—that I woke up feeling neither sore nor stiff. Snake oil? Miracle machine? I couldn’t tell you. But if you’ve got leg issues, or back issues, or neuropathies, and you’ve run out of treatment ideas, you might want to give Juvent a test drive. The platforms cost $3,000 and change, but by week’s end several players had placed an order. 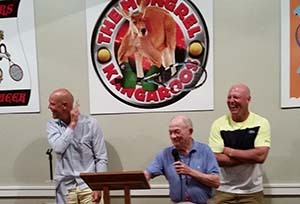 On the final night, Thursday, each of the Legends said a few words about his take on the week. Most were thanks and how much fun it had been. But I thought Murphy Jensen got to the heart of it. A nice way to end it. Well written as usual Terry. Its been 2 years since I left Newks and miss it almost every day. I’ve learned to move on from 358 days of the year there. However, the 7 days that I think I will never get over will be the Legends Week. Understand that it is not just about the Legends for me, its about you guys as well. Thank you for keeping that special place in my heart alive with your blog. It sounds like you had fun there. I hope to be there one day again…. Cheers mate!! !